Geek Culture provides online entertainment with cartoons, tech humor, reviews, forums, and more. With daily updated content, a vibrant Forum community, and the Joy of Tech comic, we are a much bookmarked and much-returned-to destination. Our audience is tech savy, or wanting to become such... they are a perfect market for your gadgets, goodies, software, and services! 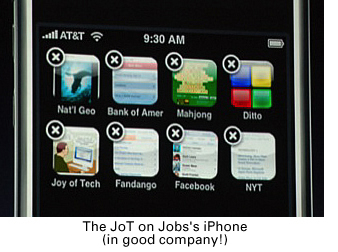 The Joy of Tech comic is particularly beloved among the IT crowd, Apple users, and social news sites. Stumbleupon.com, facebook users, twitter folks, and reddit.com often link directly to us. All this adds up to lots of traffic, and lots of new "fresh" visitors. So... what are you waiting for? Your customers are right here, right now, waiting to be impressed upon. Check out other tech sites, and you'll find our rates are extremely competitive! We can deliver the exposure you want for less... so why pay more for the same eyeballs? If you're interested in a custom campaign or an ad that is unique in size or presentation, we can customize a package to your liking. Email us to get started on your custom campaign. We particularly like working with smaller companies and developers, as we love to make web advertising available to smaller start-ups, and we try our best to make each campaign as successful as possible. As an exclusive sponsor of The Joy of Tech, we feature you in a unique campaign! We remove ALL other advertising and extraneous images, change the whole look of our site, and devote our entire page to your ad. The page is mean and clean, and you get all the credit! This runs for up to an entire week, up to seven days of exposure on our most popular page, with three of our comics bringing in traffic, and it continues into the archives for a whole year! You can decide how big you'd like your ad, and if you want to change its position, that's fine with us too. Check out our example page here, or this actual exclusive sponsorship. And remember, this sponsorship continues into the web archives, and your exclusive ad remains with the cartoon in the archives for at least a year, regardless of impressions! You are also featured in our RSS feed! Whoa, that's an amazing value, and one that is news-worthy in itself! Not only will you get the exposures, but you will be part of a buzz about the ad and the site change... our readers will be grateful to you for removing all the other ads! (Note: after your campaign on the main page is over, your ad continues in the comic archives with unlimited impressions for at least a year! This also includes an announcement in the Forums and on our Joy of Tech page welcoming you as a new advertiser. Great value! up to 200 x 200 pixels! On special for only $2.50 CPM! As an Official Sponsor of The Joy of Tech, we run a unique badge ad with your logo and link beside the comic. This also includes an announcement in the Forums and on our Joy of Tech page welcoming you as a new advertiser. 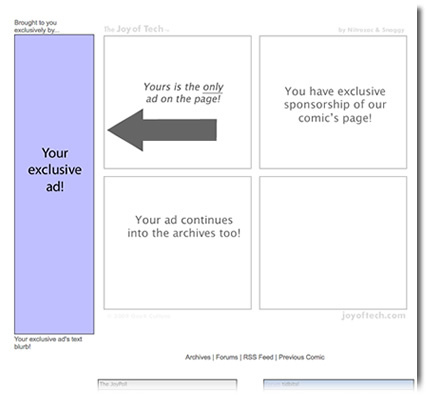 This sponsorship continues into the web archives, and your badge ad remains with the cartoon in the archives for at least a year! Whoa, that's a ton of value! The Joy of Tech Featured Sponsorship! Also includes an announcement in the Forums and on our Joy of Tech page welcoming you as a new advertiser. Special: Order 1 million impressions and save $500.00! Top of page, wide screen banner, 728 x 90 pixels. Includes a text blurb in the Forums and on our Joy of Tech page welcoming you as a new advertiser. 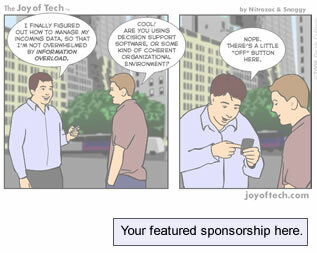 Text campaigns that are placed directly under the Joy of Tech comic do well. Usually these are plain text blocks, but we can place a tiny custom graphic for you there as well. Only $150 per week, $480 per month, or $790 for two months. Text ads also include tweets in Snaggy twitter feed, (2500 followers), and G+ feed (4,696 in circles) whenever the comic is updated. In addition, we also include the text ad in the Joy of Tech's syndicated feed (RSS). A promotional item from the sponsor appears in the feed at the start of each week, again in the Tuesday night update, and we also remind people of the sponsorship in the Friday updates! only $150 per week, or $480 per month! Skyscrapers are extremely effective for getting the attention of a viewer, and for relaying you message. Our advertising rate for skyscrapers is currently $2.50 CPM (cost per thousand) and includes an announcement in the Forums and on our Joy of Tech page welcoming you as a new advertiser. We've been in business for over fifteen years now, and are truly a web institution. We've been featured in many national newspapers and magazines including The Globe and Mail, Shift, and Rolling Stone, and featured in media such as Tech TV, Shift TV, and WIRED news, and we are featured three times weekly on the highly regarded Recode.com, and in several print magazines around the world. And we were blown away, when at Macworld Expo, several years ago,during a demo of the iPhone... we saw some of Steve Jobs's webclips... and there we were!